When I picked up the green tomatoes for the fried green tomato BLT sandwiches that I made earlier in the week, I got a whole basket of them and I had a lot left over. Luckily I had found just the recipe to use some of them up in on Steamy Kitchen in the form of a green tomato and jalapeno jam . I had heard of chili pepper jams and jellies in the past and they always sounded so interesting and I had been wanting to try one out. With the extra green tomatoes that I had on hand it was to perfect time to make one. This jam kind of reminded me of a chutney with the garlic, ginger and cider and it promised to be good. The jam was pretty easy to make! I boiled the green tomatoes for a while so that I could peel them more easily and then I pureed the other ingredients and simmered everything until it thickened. The final result was really amazing! It was nice and sweet and yet at the same time savoury and of course there was a really nice heat to it! I am looking forward to experimenting with this green tomato and jalapeno jam. Puree the jalapenos, herbs, garlic, ginger vinegar and soy sauce in a food processor. Place the mixture into a sauce pan and add the tomatoes and sugar. Bring to a boil and simmer until it thickens, about 45 minutes. That jam must be so good Kevin. I'll have to make it. Thanks. Sounds utterly tempting kevin, I am pretty sure it tastes delicious. The first time I read the title, chutney came to my mind. Sounds amazing and if I could get green tomatoes I'd love to try it. I posted a jalapeno jelly the same day as you! You made good use of those last of the season green tomatoes. Nice photo too. That tomato looks like you got it in Chernobyl on my computer moniter. And at first I thought it said Green Tea and Tomato Jam and I was a little put off, but this looks fantastic! Oooh that sounds so interesting! I love those flavors together and I love Steamy Kitchen! I think this is something I am going to HAVE to make!! I put up jalapeno pepper jelly and love this idea of the green tomatoes to make a jma! Beautiful picture! Is this jam to be put through the water canner to store in the pantry, or is this a refrigerator/freezer item? This sounds super good and less scary than most jam-making recipes. I may actually try this! thanks for the recipe, Kevin. I quadrupled it to make a nice big batch. Delicious. I bet it will be awesome with cold roast meat! I have jalapenos and green tomatoes in the garden… I better make some of this soon! It sounds delicious – I just made a similar chutney and it's even better if you leave it for 2 months to mature. All the vinegar and sugar, means it'll keep fine in a cool cupboard (transfer to the fridge once opened) if it's properly sealed. Love the ginger and soy sauce in it. Didn't expect that. I bet this would be divine on pork or poultry. that's a great photo too. I adore unusual jams and jellies! This is perfect! This one is a keeper for me. I have done quite a few jams this year, love the fire & the herbs in this.. like chutney. Would be so awesome on some cheese & with some grilled meat. Mishqueen: I figured that I would be eating this jam up fairly quickly so I did not bother canning it properly and I am keeping it in the fridge. Given that high acid/ph content from the cider vinegar, this jam should keep well if you decide to properly can it. That's an awesome combo, it would really make a sandwich! This sounds fantastic, I bet it tastes delicious! Can you substitute powdered ginger? If so, how much? Stephanie: The powdered ginger would have a different flavour profile but I think that it would be good as well. I would probably go with 1 teaspoon. Crystallized/candied ginger would probably also be nice. I made this today and added some red peppers, its cooling off in the fridge. Can't wait to try it, the smell is wonderfull!!! Hi, I love the sound of this recipe but I can't find Jalapenos where I am. What can I substitute for them? By the way, I love all your recipes. Perfect for an apartment dweller like me. CafeNirvana: The jalapenos are there for the heat so I would say that most hot peppers would work. A straight chili pepper sauce would also work in a pinch. I prepared it just as you wrote and it was blazing hot. I find that most of your comments come from people who have not even tried the item. I can't believe no one else commented on the heat. Next time, I'll seed probably all four of the jalapeno's. I was wondering the same thing about seeding. I went to the website where Kevin credited the recipe and she says to seed the jalepenos. Hope that helps. I tried this recipe and the flavors are great, but i found the cooking time and getting to the right consistency to be a big problem. I doubled the recipe it was very liquid-y for a long time and took over 2 hour to thicken. After it cooled down, I stored it in an airtight container. After 24 hours it has turned into something extremely thick gluey and hard to spread. Can you suggest an ingredient to use to dilute it to the right consistency? Steven: I was thinking of this jam as closer to a habanero jam and since I like things hot I added the seeds. If you don't like things as hot I would definitely recommend seeding the jalapenos and starting with less. After simmering for say 20 minutes test it and if you want more heat add some more. BL: I am not sure why it would have gone hard. I still have some in my fridge and it is nice and spreadable after a month. 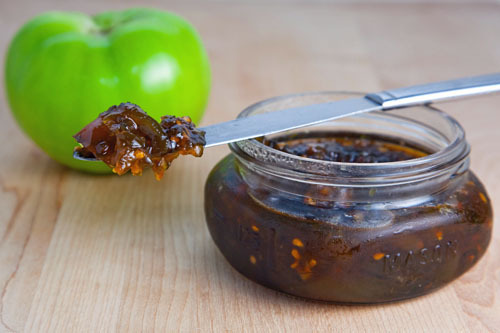 You might try mixing some cider vinegar into a small amount of the jam to see if that works. You may also be able to microwave what you want to use for a few short seconds to make it more spreadable. I did diluting suggestion. It worked! I was afraid to add more vinegar for fear that it would ruin the taste but it was fine, I added a little white wine too and heated it up again over a double boiler. Making your Roasted Butternut Squash with Caramelized Onions, Gorgonzola and Crispy Fried Sage next! I have to let you know that I found this recipe one night when we had out first frost warning and I had to pick a ton of tomatoes (and peppers!) I still had in the garden. I made this and served it over cream cheese on crackers for both Thanksgiving and Christmas and people absolutely RAVED over it. Next year I'll be growing tomatoes especially for this! I just started making my batch – essentially slightly modified for African conditions. Unfortunately had to leave out the ginger, and couldn't think of a suitable alternative. Nevertheless, my taste 'in progress' left me chuffed. The end product is bound to be superb! Thanks for this one Kevin! Hi Kevin, thanks so much for the recipe! I've made this 4 times already. Instead of using jalapeno, I used habanero…yeah, gotta change my version to "habanero jam" I guess 🙂 It's so so good!! Made this today. Flavor wonderful but it didn't thicken after an hour of simmering. What next? Hi I just want to double check what you mean by a green tomato here because the photo looks a lot like a tomatillo without the husk rather than an under-ripe tomato, which would be a totally different flavour. Thanks for the clarification. Callie Clark Wiren: Yes, a green under-ripe tomato. The one in the photo is an under-ripe beefsteak tomato. we made this and it is really nice but a bit sweet, i think next time we'll cut down on the sugar a bit. This looks interesting, so wondering if I can use it with ripe tomatoes? Perfect Witch: It won't be the same but I am sure that it would be good!